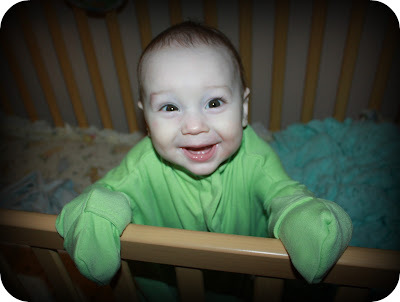 mommy's reviews: Baby Eczema Relief with Bamboo Bubby! We here in our house have the worst problems with eczema...particularly baby eczema. I had my first experience with baby eczema when my first child was born and she had it really bad. When I showed a friend of mine, we were unsure if it was really eczema or ring worm but after a visit to the pediatrician, we confirmed that it was indeed eczema. There is nothing worse than watching your baby scratch and scratch with no relief in sight. I tried just about every cream and body wash out there but Hannah's skin was really tough to treat. She is just now starting to grow out of the eczema but now I have Isaac. He is presenting with very different eczema symptoms than Hannah...cracked and raw skin behind his ears, and horrible eczema on his neck, shoulders and wrists. It is AWFUL. One morning, he woke up and had crusty blood on his hands and under his fingernails. After examining him, I realized that the blood came from behind his ears. He had totally dug up the skin from scratching throughout the night. The itching seems to really bother him more so than it ever bothered Hannah. As a mom, that REALLY bothers me. So in my desperation, I began to search the Internet for a solution. I knew that I would need to cover his hands in order to prevent him from scratching but how in the world do you cover a 9 month old baby's hands? My question was answered when I happened across the Bamboo Bubby website. 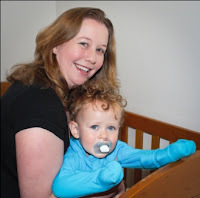 This company is based in Southern Australia and they make a product called the Bamboo Bubby Bag and it is specifically designed for babies and toddlers with eczema. One of the secrets to the success of this bag is the fact that the material is made out of bamboo fabric. Until becoming acquainted with Bamboo Bubby, I had no idea that fabric made out of bamboo is hypoallergenic and antibacterial...makes total sense to have a product for sensitive skin made out of bamboo fabric!! After testing many different types of fabrics and prototypes, the Bamboo Bubby Bag™ has become a practical and popular choice amongst parents worldwide, minimising damage caused by scratching from eczema, dermatitis and even chicken pox as well as stop thumb sucking and even helping babies who would wake from cold hands. I was ecstatic to find this company. My Isaac was suffering terribly with the scratching and I was sincerely wanting to find a way to keep him from damaging his skin any further. Hannah never had issues bleeding with her eczema so this was new territory for me. Kelly was so sweet when I first emailed her...and has been such a blessing throughout this review. I am very pleased to introduce this company to you. So, for this review I was sent a Bamboo Bubby Bag to try on Isaac. Ok, so this sleeping bag is H.U.G.E! It pretty much spans the whole 4 feet of the width of my dining room table. :) The reason for this is because you can use this bag on babies ages 0-2+ years. So if you are using this on an infant, it will be long but is totally adjustable in several ways, which I will show you. The pictures above show the inside of the sleeves, right by the armpit area. 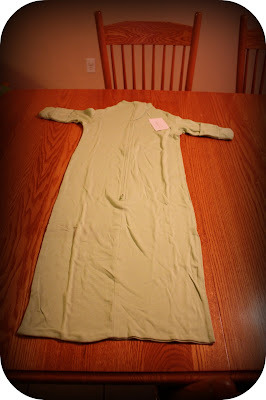 There is a nice snap that basically adjusts the armhole size. 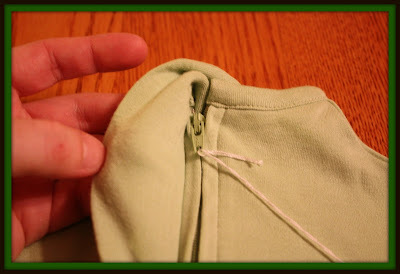 If you have a small baby (like I do), then keep the button snapped and this will ensure that their arm will not be floating around in a huge hole. The picture on the right shows the snap undone. 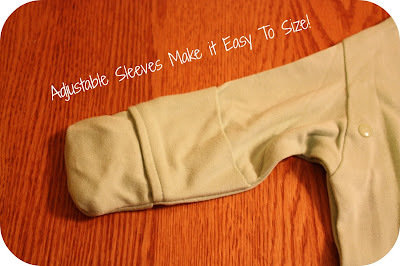 I also love that the sleeves are adjustable. 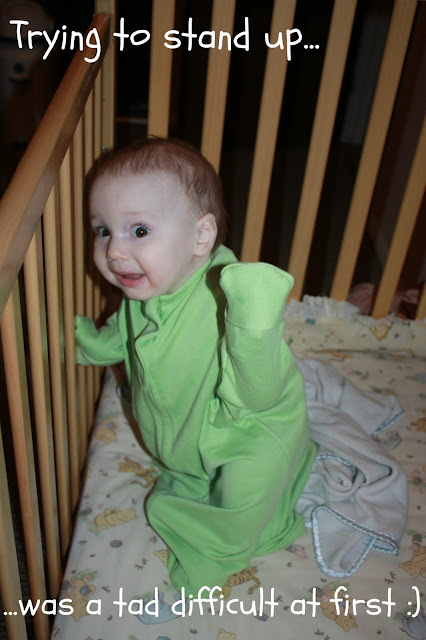 There is absolutely no way for babies hands to get out of these sleeves! 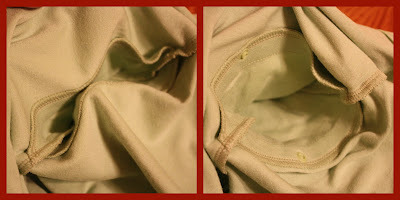 All you do to adjust them is tuck the extra fabric inside and pull the cuff over. You want to be sure to smooth the fabric down on the inside of the sleeve so baby isn't dealing with alot of material bunching up in there. Another feature that I am enjoying is the fact that there is a nice protector that covers the zipper and this cover actually wraps around the neck line so baby won't get scratched by any part of the zipper. I have also noticed the the neckline goes up on Isaac's neck so he really can't get to the skin on his neck. This is really REALLY nice. I will also note that the Bamboo Bubby Bag has a seat belt slot in it so your baby can wear it while in the stroller or car seat...which is also fantastic!! To give you an idea of what I am dealing with, there is a picture of his ears. This is on a GOOD day. This area has never healed completely. 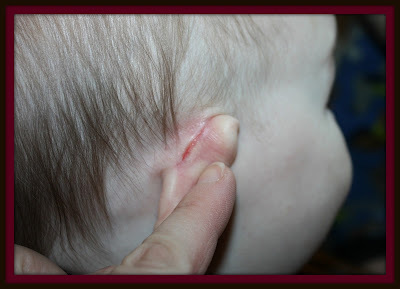 Ever since he was a newborn, we have had issues with his ears and the eczema just splits the skin open. Obviously, scratching doesn't help. Getting Isaac used to the Bamboo Bubby Bag was quite an interesting experience. I was scared at first to try it because he is a very "hands on" baby. He has a pacifier and can put it in his mouth by himself. He also has a cuddly blanket that he snuggles up to his face when he sleeps and I was worried the hand covers would hinder his self-soothing abilities. Kelly gently assured me that babies that use the Bamboo Bubby Bag do quite well at learning to use their hands even though they are covered. I was so happy to hear this! 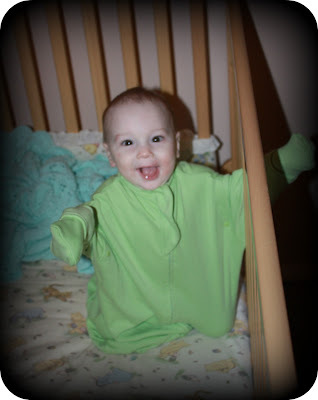 So, I put the Bamboo Bubby on Isaac and we were ready to try it out! Ha ha...he had issues at first. :) Look at that face!! Because the garment is long, he stepped all over it when he first tried to stand up with it on. Then, he finally figured it out. He was quite pleased with himself too, as you can see! :) He has been sleeping with the Bamboo Bubby Bag for a few nights now and I am very happy to report that he has not had any issues with bleeding. His eczema is also looking less red and inflamed, which is a sign that he has not been scratching. I was so nervous about his pacifier too, and he has managed quite well when it comes to maneuvering it back into his mouth. Our first few nights getting used to the Bamboo Bubby Bag were a bit rough but after that, he was sleeping like a champ again! I was so relieved when I saw him trying to scratch at his ears the other night while nursing because I knew he wasn't actually tearing up his skin. What a blessing! The Bamboo Bubby Bag retails for $69.95 and is also available in a twin pack which retails for $130.00. You also have your choice of three colors: Turquoise Blue, Fuscia Pink and Sage Green. 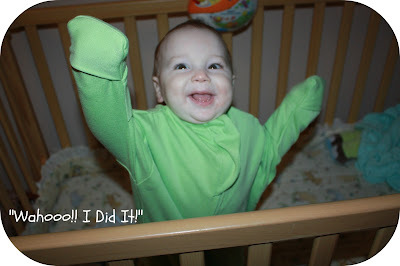 Also, Kelly has let me know that she now has two companies stocking Bamboo Bubby in the US! Click HERE to find out where you can order Bamboo Bubby in the US. The price for purchasing in the US is slightly more($79.95), however, Kelly will soon be raising the price in Australia to match the US price. If you are interested in keeping up with Bamboo Bubby on their social media sites, be sure to check them out on Facebook, Twitter and also Pinterest! So, in my opinion...Bamboo Bubby is a fantastic company that makes a one-of-a-kind product...one which I have been searching for since Hannah was a baby! I am so thankful that I have discovered them and hope that this product will help many more parents out there that are just like me! Children deserve to be comfortable - day and night and Bamboo Bubby is the product that will be sure to keep them comfy and happy. I love how this has given me an all natural treatment for eczema! I would definitely recommend this product to ANYONE! Disclaimer: I received no monetary compensation for this post. I did receive free Bamboo Bubby products for review purposes. All quotes and stock photos are from the Bamboo Bubby website and email. All thoughts and opinions are 100% mine.